The trend of coloured alloy wheels, in particular black, is increasing in popularity. 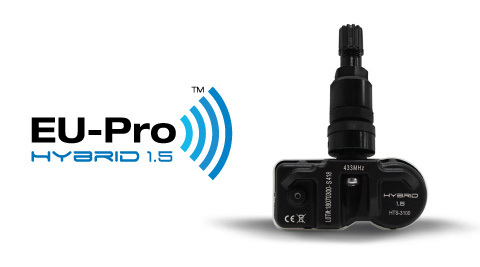 So, we have introduced our EU-Pro Hybrid 1.5 sensor, which boasts 99% coverage of 2018 vehicles with a black Clamp-In valve. The EU-Pro Hybrid 1.5 black Clamp-In valve has passed a series of rigorous tests, including chemical and salt corrosion (typical during Winter months) due to its anodized coating. The black Clamp-In also includes a protective ring, otherwise known as a washer, which enables users to tighten the valves' collar without scratching the alloy wheel's surface. What's more, the manufacturing process of our EU-Pro Hybrid 1.5 is certified according to TÜV Süd Quality Management System guidelines. Therefore, customers can rest assured that they will obtain premium products.